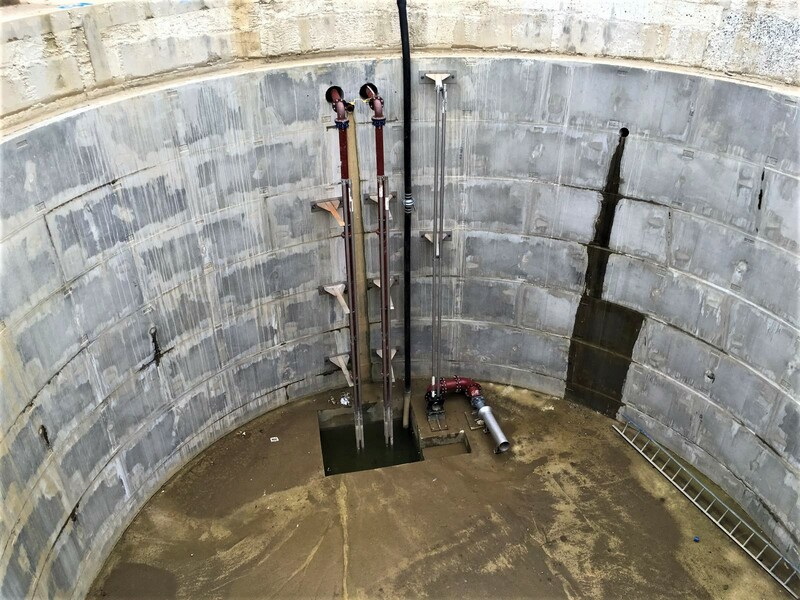 Buckhurst Shaft Sinking Project | Terra Solutions Ltd.
Terra Solutions were engaged to bring their expertise in trenchless engineering to bear on a shaft sinking project at Buckhurst. Their client, Barratt Homes, needed a shaft constructed that could serve as an underground pumping station for a new housing development. The shaft was designated to be 10.50mø and 12m deep below ground level (BGL). The working site presented challenges in that it was a very active building site with residents already living there. It was also located beside a watercourse where newts and ducks had made their home and this was highlighted by the environmental management plan. The first step in creating this new structure is to excavate the ground level down by 1200mm. The steel cutting shoe and choker ring are then installed around the centre point of the excavation and the second ring is prepared to be placed on top. For this job Terra Solutions opted to use the Caisson method, whereby the rings are built on top of the cutter and will sink under their own weight if carefully managed during execution. The first two rings were surrounded by a polystyrene wrap- used to create an annulus- so the shaft was free to move once to concrete had set/cured. This also allowed lubricant to be poured later in the job, reducing the skin friction acting on the rings/shaft. Sufficient space was left to install the 1350mm x 1200mm concrete collar around the outside of the segments. Threaded bars were installed in the concrete before it set to facilitate the installation of hydraulic rams if deemed necessary later in the job. Jacking rams were installed in case the segments stopped moving under their own weight, or if due to a change in ground conditions the lead shaft sinker deemed it necessary to do so. Jacking rams have the added bonus of negating any issues with verticality. The ground within the shaft was excavated in a controlled and methodical manner, trying to avoid the excavation of any one area more than another. As the shaft began to move the next ring was constructed on top of the previous rings. Each ring consisted of 8 back bolted shaft segments (supplied by F.P McCann) which were tied into the ring below using T-Bolts to form one continuous unit. Once the arm of the excavator can no longer reach the bottom of the pit, it was fitted with a clamshell bucket so excavation could continue to depth. A small 5ton machine was placed into the shaft to trim around the cutting shoe. 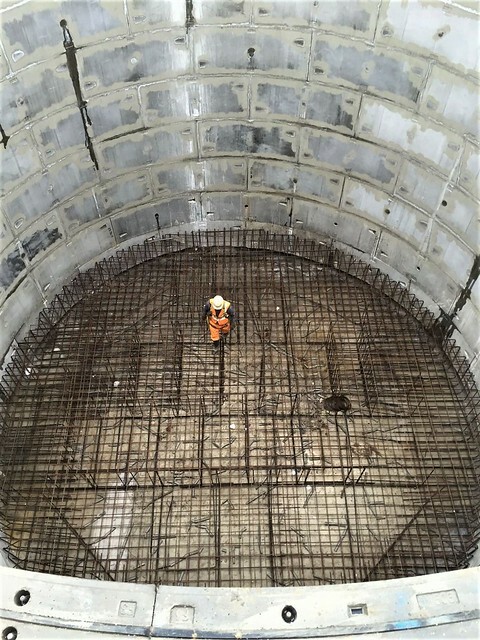 As the shaft was being constructed, it became clear that lubrication would indeed be required to reduce the frictional forces acting on the concrete rings. A bentonite based lubricant was pumped into the annulus between the segments and the ground around them. The rings continued to be placed on top of one another, sinking the shaft by the force of its own weight until the required depth (12m) was achieved. Using the annulus installed earlier in the job, Terra Solutions then applied a cementitious grout to minimise any further shaft movement before the cutting shoe was removed. This also acted as an external permanent barrier to the surrounding ground, which also curtailed water ingress. The intricate, hand tied steel mesh that would form the reinforced base of this shaft. When the shaft was at the correct depth the steel cutting shoe was removed, dowel rods were inserted into the bottom ring and tied to a mesh frame for creating a reinforced concrete base. The complex reinforcement arrangement in the base for this structure demanded precision engineering that only experience like Terra’s can accomplish. The steel was all hand tied, a time intensive task, and was then built up to the required levels. The concrete was then poured using a concrete skip with a geared discharge chute. A sump was created which would later facilitate the permanent pumping arrangement. This included an intricate benching arrangement which directed flows to the pumps, the benching was floated and finished to the required high standards. The final element of this works for Terra Solutions was to caulk and point the shaft. This process smooths and seals the inside of the shaft, and was completed in this instance by a team member in a man-riding basket attached to a crawler crane. A davit arm was in place throughout this works, ensuring the safety of our team members. The shaft sinking project that Terra Solutions carried out at Buckhurst proved to be a success. The shaft was delivered on time and was exactly as specified by the client, despite the myriad challenges posed by the bespoke base.